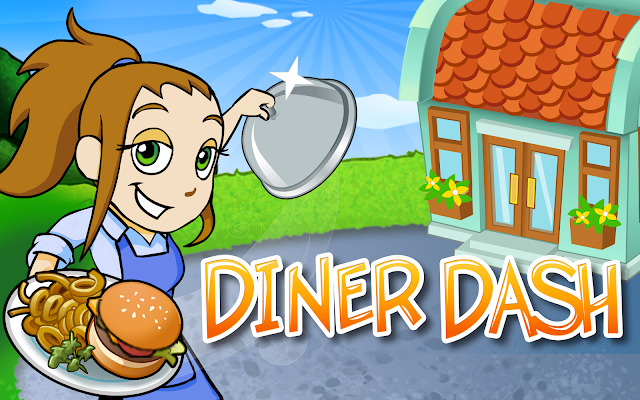 Diner Dash is a popular PC Arcade game that follows young Flo in her quest to build a successful chain of restaurants. The game is a combination of strategy, arcade, and time management. Players progress through 50 increasingly challenging levels, upgrading their restaurants and moving on to new restaurants as the tasks progress. Diner Dash has not violence, no mature themes and no strong language. Game play is suitable for all ages, although younger players may have trouble when the levels become more difficult. The graphics are colorful and play progresses quickly enough through the various levels to remain interesting. The music is repetitive but not too irritating. Tasks are completed with the mouse in a simple point and click play mode. Click and drag customers to a table, click on the table when they’re ready to order, click on food and then a table to serve. Although the interface is simple, play becomes very challenging in the higher levels as players must struggle to complete numerous tasks in a limited time frame. Players can succeed by meeting minimum daily earning requirements or earn bonus points and a gold star for the level if they surpass expectations. Diner Dash is limited to two play modes, Career and Endless shift. In Career mode Flo must fix up each restaurant as she earns rewards through each shift. Flo can earn upgrades to the restaurants in each shift and players get to choose their decorating and upgrade options. In Endless shift, Flo can serve tables forever in one restaurant which gives players a chance to practice their point and click play and time management skills. Diner Dash can be purchased on CD-Rom or Downloaded from numerous game sites. Average price is $19.99, but the demo version is offered for download with a 60 minute time limit. The game can sometimes be found on sale in computer stores like Fry’s and Best Buy for $9.99 or less. Diner Dash is an addicting and challenging game yet extremely simple to learn. The reviews for it by players on the web are stellar. Yahoo Games users rate it an average 4 ½ out of 5 stars, with over 32,000 users rating it. The 60 minute demo versions provide just enough time for the player to get addicted and want to buy. Overall it’s definitely worth the $20 price tag.